It is not hard to find exceptionally STYLISH and well-dressed people in Paris, that’s for sure! They are everywhere. Paris is like a CANDY SHOP for the style-hungry! Despite our constant sensory overload during this trip we were both equally impressed when we ran into this oh-so-chic Parisian girl in Marais today. 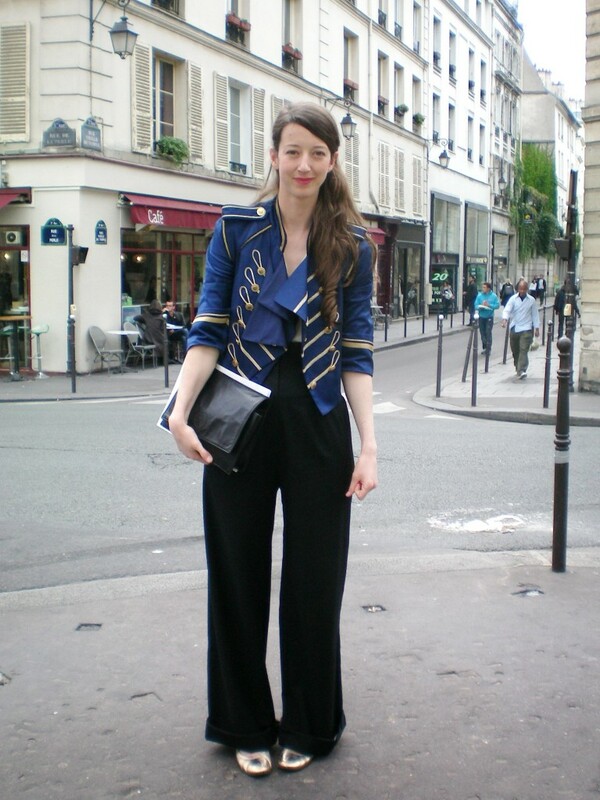 Her black & blue vintage outfit definitely deserves the “Miss Marais”-award, don’t you think;-)? i LOVE that jacket…such a cool look! Großartig. Und das komplette Outfit ist Vintage? LUVV the blog! Check out our fashion, style, and celebrity gossip blog! The whole ensemble is amazing, definitely worthy of its title! i love the jacket. I would like it better in black tho for myself. Im too short to pull it off without looking like i’m in a highschool’s football team band. That jacket is beautiful. It looks classic and can be worn in any season. that jacket is amazing! I could be bias cuz I have a similar one in black, but still..